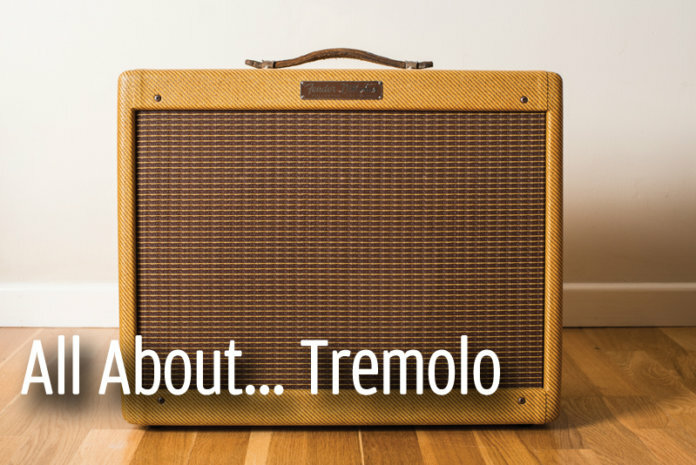 Tremolo is the daddy of guitar effects and we’ve used it since the 1940s. But there has always been confusion about what it really is. Those of us who experienced the unremitting tedium of formal music lessons may recall long lists of Italian terms that had to be memorised for theory exams. Among them might have been the words “tremolo” or perhaps “tremolando”. The musical use of tremolo predates electronic effects by several hundred years – at least. Tremolo was almost certainly first produced by string players moving bows back and forth rapidly using very short strokes. Since sound is generated only when the bow is moving, it’s clear that the volume level must drop as the bow changes direction. This results in a series of volume peaks and troughs and, if the player’s technique is good, then the effect will sound smooth and regular. Check out the intro of Bruckner’s Symphony No. 9 to hear this in an orchestral context. Tremolo is a key technique in mandolin playing, too. A plectrum is used instead of a bow, but the rapid back and forth movement is the same. In both cases, a playing technique is employed to create the tremolo, but tremolo as an added effect was first heard on church organs during the 16th century. The effect was produced mechanically, with a diaphragm opening and closing to modulate air pressure – but pitch fluctuated along with volume. Rhythmic pitch fluctuation is called vibrato, which is different to the volume fluctuations of tremolo. Nevertheless, both terms have long been used interchangeably and incorrectly – in the musical world as well as the patent office. So Leo Fender can be excused to some extent. By the 1930s, electronic musical instruments were being developed, and the first electronic tremolo effect appeared on the market in 1941. Most electric instruments have volume controls so that you can create your own tremolo effects. Hit a chord and turn the volume knob back and forth and you’ll get tremolo – but would you really want to do that all the way through an entire song? It makes a great deal more sense to automate the process, because it’s far less exhausting, it sounds better and both hands are then freed up to deal with the real business of playing. It’s well known that DeArmond developed the first electronic tremolo, but they were initially installed in the electric Storytone piano during the 1940s. 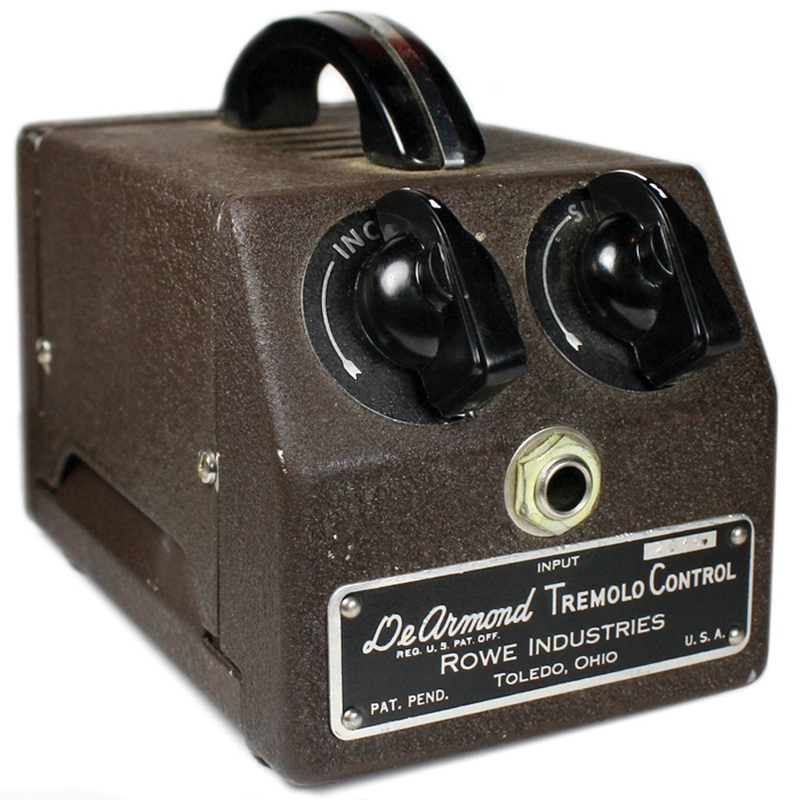 Before long, DeArmond’s ‘Tremolo Control’ became available as a standalone unit that can legitimately claim to be the first guitar effect. A motorised spindle shook a canister containing electrolytic fluid. As the fluid sloshed around, it conducted varying amounts of signal to ground, which made the guitar volume fluctuate. Many of these units were discarded after the electrolytic fluid dried up, but they can be rejuvenated with an injection of Windex cleaning fluid. Bo Diddley and Muddy Waters used this tremolo, as did Duane Eddy on Rebel Rouser. Billy Gibbons is also a fan and tells some great DeArmond anecdotes, but it’s wise to take most of what he says with a generous bucket of sodium chloride. Mechanical tremolos, like tape echoes, require maintenance, and invariably wear out. This made the move to purely electronic tremolo inevitable. 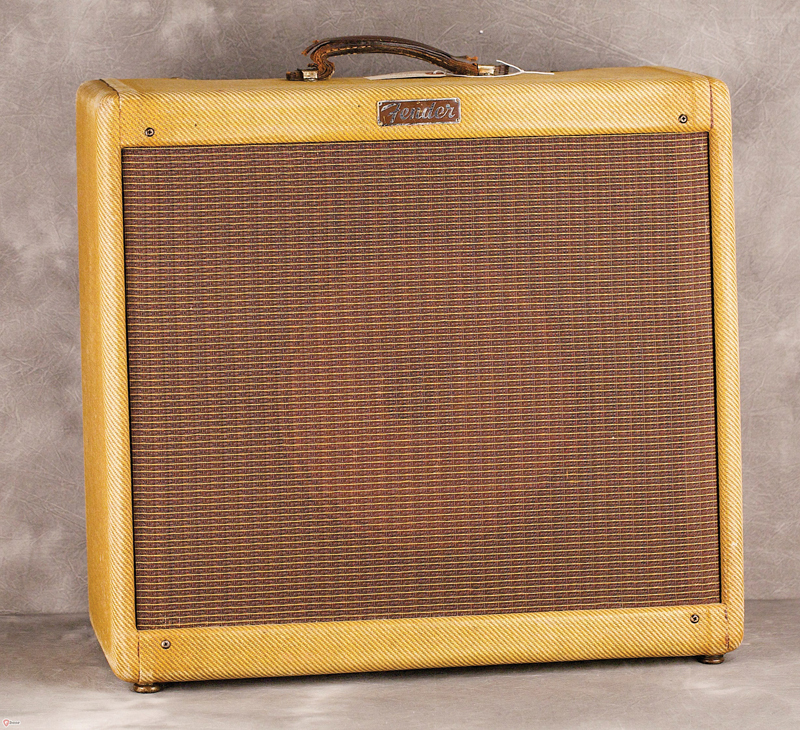 By the late 1940s, Danelectro, Multivox and Gibson were selling tremolo-equipped amps. Magnatone and Fender finally boarded the trem-train in 1955. It’s interesting to note how Fender’s implementation of tremolo evolved over the years. In the 1955 Tremolux, a 12AX7 valve was used as an oscillator to generate a varying voltage that was applied to the cathode of the phase inverter valve. This varied the bias, which partially turned the phase inverter valve on and off and caused the volume to rise and fall. For the later Vibrolux, the oscillator voltage acted on the bias of the power valves. Many aficionados regard the brownface-era ‘harmonic vibrato’ as Fender’s best design. It achieved a pseudo-vibrato effect by splitting the signal into high and low frequencies and modulating one with low-frequency oscillators working in opposite polarity. The result falls somewhere between tremolo, vibrato and phasing. During the Blackface and Silverface eras, Fender used a photocell resistor – essentially a resistor that reacted to light. Simply put, the oscillator drove the light source and the resistor acted like a light-driven volume control. This type of trem is characterised by an asymmetrical response, where the volume rise and fall occur at different rates. 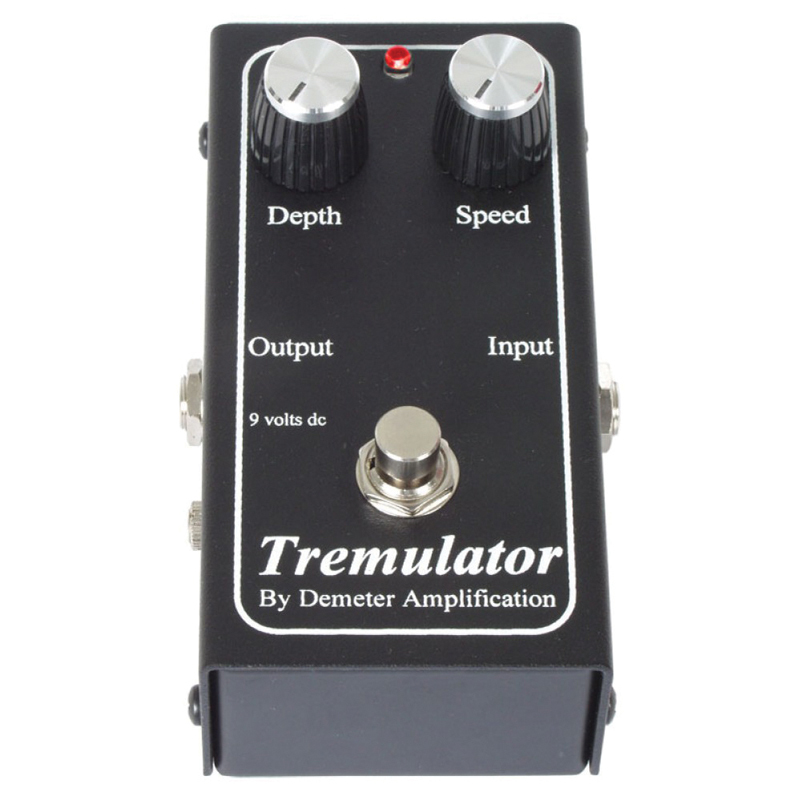 The Demeter Tremulator emulates classic Fender optical tremolo. Amps with built-in tremolo tend to be bigger and more complicated. The tremolo circuits occasionally fail, and where there’s a ‘normal’ channel and a ‘vibrato’ channel, the former is often considered to sound superior. If tremolo is an occasional treat for you, a tremolo pedal will be cheaper, less hassle and your core tone may be better if you’re not obliged to play through a ‘tremolo/vibrato’ channel. With amp tremolo, you are stuck with the basic characteristic of the circuit, but as we’ve discovered, tremolo is a more subtle and nuanced effect than simply a volume pulse. If you would prefer Brownface tremolo with your tweed amp or optical trem with your Brit-inspired Class A combo, pedals allow you to mix and match. Most amp tremolo controls are limited to speed and depth – or variations on the theme. Choosing the right tremolo is about feel as much as sound, so the waveform of the oscillator makes a huge difference. 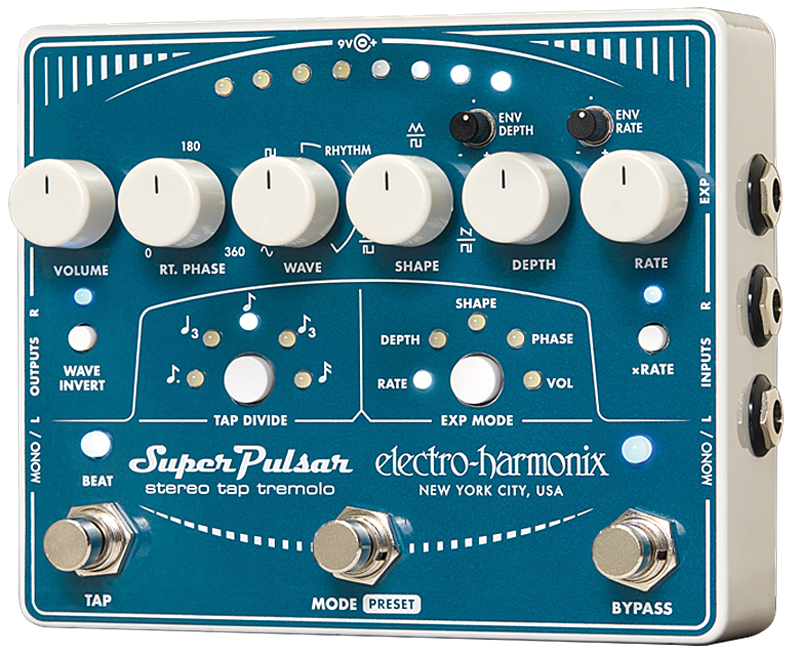 Some pedals enable you to set the waveform to taste for a variety of tremolo sounds and feel. Remember how Johnny Marr matched his trem speed to the tempo of How Soon Is Now? It’s hard to achieve using an amp, but some trem pedals have tap tempo and even subdivision switching. Maybe you prefer fast swell and slow decay, or vice versa? There are pedals that will allow you to do both, or even select a symmetrical shape. Modern tremolo pedals come in many forms, with op amps, JFETs and even valves. Some of these pedals have photocells, just like Blackface Fenders, and you can even choose between mono and stereo. Unlike chorus and phasing, tremolo has a timeless quality, and the choice has never been better for occasional users and obsessives alike. Check out our picks of the best tremolo pedals here.